Tugtar basalt ar charraig easbhrúite bholcánach, is é sin, carraig a cruthaíodh nuair a d'fhuaraigh laibhe go cloch i ndiaidh di brúchtadh amach as an talamh. In Éirinn, is é an tOir-Thuaisceart - is é sin, stáitín Thuaisceart Éireann - an réigiún is mó basailt. 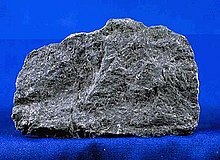 Basalt atá i gceist leis na clocha i gClochán an Aifir (Clochán na bhFomhórach), abair, nó cruthaíodh an Clochán ar fad nuair a d'fhuaraigh sruthán laibhe. Tugadh an leathanach seo cothrom le dáta an 3 Feabhra 2019 ag 13:15.